The invention relates to the use of a dopamine agnostic active ingredient with a short half-life in the form of a transdermal therapeutic system (TTS) for treating illnesses which can be treated by dopaminergic means. is a single or double bond wherein R1 is an H atom or a halogen atom, particularly a bromine atom, and wherein R2 is C1-4 alkyl, particularly methyl. More specifically, it is preferred that the TTS comprises a pharmaceutical layer containing at least one matrix that contains an active ingredient and/or an active ingredient reservoir and a diffusion barrier through which the active ingredient can permeate on the skin side of the TTS and, as the active ingredient with a short half-life, an ergoline derivative of the formula I or a physiologically tolerable salt thereof with an acid, said ergoline derivative having a half-life in the range from 0.5 to 4 hours, particularly from 1 to 2 hours, so that a drop below the therapeutic threshold for 1 to 3 hours can be achieved. The matrix and/or diffusion barrier can be selected so that the transdermal flux F through human skin measured as described in Example 1 is in the range from 0.1 to 5.0 μg/cm 2/h. It is preferred to select F and the active surface area to achieve levels in the plasma from 0.1 to 2 ng/ml. The active ingredient dose in a human body carrying a TTS is dependent on the diffusion-related properties of the TTS mentioned above and also on its active surface area on the skin. Active surface area means the area over which the matrix or diffusion barrier comes to rest on the skin. Variation in accordance with the desired dosage will preferably be in a range from 1 to 100 cm 2. Within the scope of this invention, a physician can easily set up personalized dose variations for a flux adjusted to the given indication by selecting a suitable patch size. Thus the treatment can easily be adjusted to different body weights, age groups, etc. It is particularly feasible to equip a TTS comprising a (rather large) standard area with subdivision markers for partial doses so that a user can just separate and use a partial area corresponding to the specified dose. The respective subsections can easily be printed on the covering layer. The invention will be explained in more detail below based on various non-limiting examples. A FRANZ flow-through diffusion cell is used for flux measurement. The measured area is 2 cm 2. 4 cm2 of ventral and dorsal skin of a male hairless mouse (MF1 hr/hr Ola/Hsd, provided by Harlan Olac, UK) are used as skin sample after carefully removing any subcutaneous fatty tissue. A 2 cm2 TTS is applied to the skin sample. The acceptor medium is placed on the opposite side. It is diluted HHBSS (Hepes Hanks Balanced Salt Solution) containing 5.96 g/l of Hepes, 0.35 g/l of NaHCO3 and 0.1 ml/l 10× of HBSS (provided by Gibco, Eggenstein, Del.). Furthermore, 1000 I.U./ml of penicillin (benzylpenicillin potassium salt, provided by Fluka, Neu-Ulm, Del.) are used. Calibration curves: These are constructed using two different methanol solutions of non-radioactive lisuride hydrogen maleate salt, each containing 1 mg/ml. These solutions are individually diluted with BSA buffer (0.041 M of Na 2HPO2*2H2O, 0.026 M of KH2PO4, 0.154 M of NaCl, 0.015 M of NaN3, 0.1% (w/v) of BSA, pH 7, supplemented with 0.05% (w/v) of ascorbic acid) to obtain lisuride free base concentrations in the range from 1,000-3.9 pg/0.1 ml. In addition, a sample without active ingredient (0 pg) is used. The calibration samples are analyzed three times. The lisuride concentrations are calculated using the pharmacokinetic PC program RIO 2.5 (other common software may also be used). 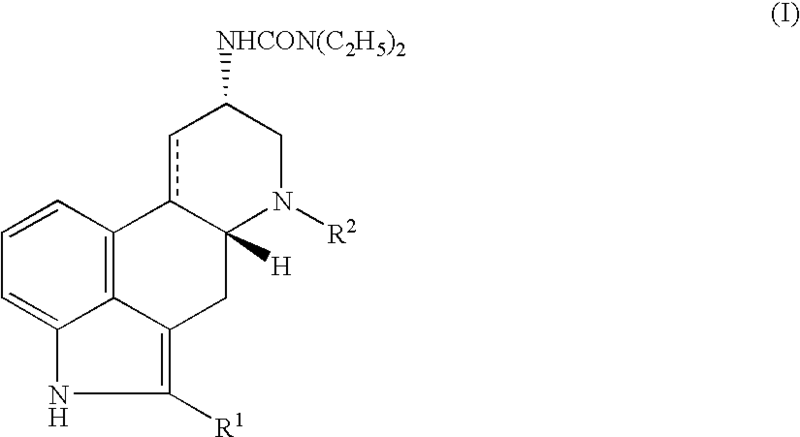 Tracer:  3H-lisuride hydrogen maleate with a specific activity of 4.3 GBq/mg is used. where F is the percutaneous flux [ng/cm 2/h], C the active ingredient concentration in the acceptor medium [ng/ml], R the acceptor medium flow [1 ml/h], A the measured area [2 cm2] and T the sample-taking interval [h]. Flux measurements as described in Example 1 showed an F value of 0.43 on day 1, 0.44 on day 2, and a maximum F value of 0.85 (each in μg/cm 2/h). Flux measurements as described in Example 1 showed an F value of 0.23 on day 1, 0.28 on day 2, and a maximum F value of 0.50 (each in μg/cm 2/h). Flux measurements as described in Example 1 showed an F value of 0.90 on day 1, 1.76 on day 2, and a maximum F value of 2.53 (each in μg/cm 2/h). 1. 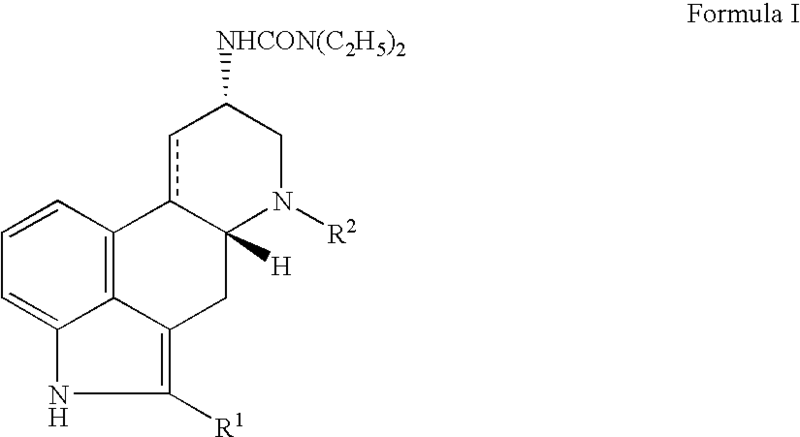 Use of a dopamine agonist with a short half-life in the form of an agent comprising at least one composition in two spatially discrete doses, of which one is a transdermal therapeutic system (TTS) containing the dopamine agonistic agent with a short half-life for the treatment of dopaminergically treatable diseases, said TTS being replaced daily at bedtime. 2. Use of a dopamine agonistic agent with a short half-life in the form of at least two discrete compositions consisting a) of a transdermal therapeutic system (TTS) that contains the dopamine agonistic agent with a short half-life and b) of one or more other preparation(s) containing L-DOPA and, optionally, a decarboxylase inhibitor for treating dopaminergically treatable diseases and suitable for oral administration, said TTS being replaced daily at bedtime. 3. The use according to claims 1 or 2 wherein the dopaminergically treatable disease is a disease from the “Parkinson's disease or parkinsonism” group. is a single or double bond wherein R1 is an H atom or a halogen atom, particularly a bromine atom, and wherein R2 is C1-4 alkyl. 5. The use according to any one of claims 1 through 4 wherein the active dopamine agonist is lisuride base or a physiologically tolerable salt thereof. 6. The use according to any one of claims 1 through 5 wherein the active dopamine agonist has a half-life of 0.5 to 4 hours, preferably 1 to 2 hours. 7. The use according to any one of claims 1 through 6 wherein the TTS comprises a pharmaceutical layer comprising at least one matrix containing an active ingredient and/or an active ingredient reservoir, and a diffusion barrier on the skin side of said active ingredient reservoir that is permeable to said active ingredient. 8. The use according to claim 7 wherein the matrix and/or diffusion barrier are selected so that the transdermal flux F through human skin is in the range from 0.1 to 5.0 μg/cm2/h. 9. The use according to claim 7 wherein a drop below the therapeutic threshold occurs for 1 to 4 hours when the patch is replaced. 13. The use according to claim 2 wherein the preparation meant for oral administration is applied in combination with another preparation for oral administration that contains a decarboxylase inhibitor. 14. The use according to claim 13 wherein the decarboxylase inhibitor is benserazide or carbidopa.